If you have or are interested in owning an English bulldog, we encourage you to educate yourself about this very special breed. These dogs have unique health concerns and their breeding is much more time and cost intensive than other breeds (which makes them more expensive) - but they also offer you so much more in return! 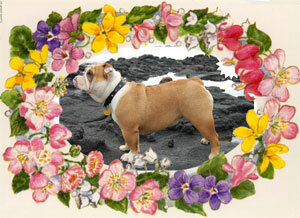 Bulldogs are family dogs and thrive best in an inside environment where they can interact as a member of the family. They are known for their cute stubbornness which can bring a lot of laughs but also requires patience. If trained and worked with, many bulldogs are able to become quite obediant over time (but they will still let you know they are able to think for themselvs). By nature, they are generally a lazy dog that only requires short walks or play time daily (but they can be very energetic and playful as puppies). Although bulldogs generally share a set of characteristics and health issues, each bulldog is different and will develop their own personality and health. In general, bulldogs love people and will not only strongly bond to a person or family, but will welcome meeting new people. If loved and cared for, they will return this tenfold! They tend to not get along with other dogs so well - but if raised with other dogs and socialized at an early age, may not exhibit this characteristic. Regarding health, the #1 consideration is an intolerance for extreme heat. ALL bulldog owners or potential owners should understand this and be able to provide a home where the bulldog is comfortable with the temperature (never panting). For some areas of Hawaii, this may mean air conditioning - for other areas, it may mean an extra fan around. If taking them outdoors, it means always bringing extra water and a spray bottle so that you can cool your bulldog down immediately if he/she is panting. A BULLDOG SHOULD NEVER BE LEFT PANTING FOR LONG PERIODS OF TIME - this can cause mini-seizures, heart problems, or even death. Well bred healthy bulldogs will most likely be able to tolerate more heat than poorly bred unhealthy bulldogs. This can truly make a difference in your and the bulldogs quality of life - so is just one reason to try to purchase the highest quality bulldog available. Other common health concerns to be aware of are: cherry eye, hip displasia, and allergies. Owners should be conscious of these and know how to deal with them accordingly. The bulldog is also at-risk for more serious health concerns, more likely to be seen because of poor breeding. This is one breed where the quality of the breeding is of utmost importance and can make the difference between you having a happy, healthy companion for many many years OR you spending thousands of dollars and being in and out of the vet for the life span of the dog. We cannot reiterate this enough!!! Trying to save some money on the initial purchase of a bulldog may backfire in the future as most likely there is a reason (which may or may not be disclosed to you) that you have found a 'cheap' bulldog. Bulldogs are truly a special addition to the right families. Their wrinkles, quirks, stubbornness, and love will add smiles to your daily life! But owning a bulldog comes with responsibilities and should not be undertaken lightly. We encourage you to educate yourself beyond what is on our website if you own or are considering owning a bulldog. It's fun and interesting to learn about the breed and, as an owner, you will realize quickly that continuously educating yourself is part of your responsibility. (Too often vets will not have breed-specific knowledge to offer you, and may even lead you in the wrong direction so it is YOUR responsibility to ultimately care for your bulldog).